Freibergite: Mineral information, data and localities. After the type locality of Freiberg, Saxony, Germany. 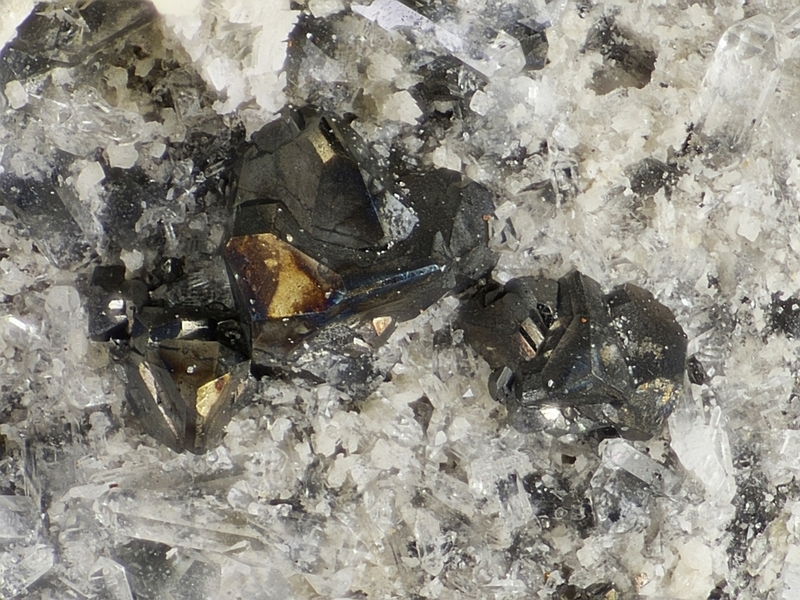 Tetrahedrite Group. Argentotennantite-Freibergite Series, and the Freibergite-Tetrahedrite Series. The Ag-dominant analogue of Tetrahedrite. 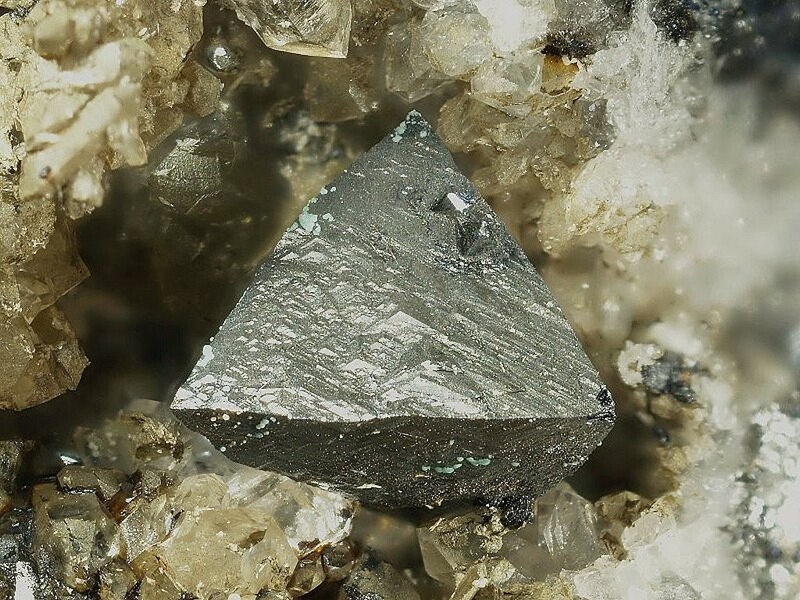 Varieties with Ag below 4 atoms per formula unit should be called Ag-rich tetrahedrite. See also the closely related, Ag-rich members argentotetrahedrite and rozhdestvenskayaite. The accurate status and definition of freibergite are still under discussion, see Moëlo et al. (2008). Quartz 64 photos of Freibergite associated with Quartz on mindat.org. Siderite 29 photos of Freibergite associated with Siderite on mindat.org. Calcite 29 photos of Freibergite associated with Calcite on mindat.org. Chalcopyrite 29 photos of Freibergite associated with Chalcopyrite on mindat.org. Sphalerite 26 photos of Freibergite associated with Sphalerite on mindat.org. Pyrite 14 photos of Freibergite associated with Pyrite on mindat.org. Dolomite 11 photos of Freibergite associated with Dolomite on mindat.org. Plumosite 11 photos of Freibergite associated with Plumosite on mindat.org. Semseyite 4 photos of Freibergite associated with Semseyite on mindat.org. Pyrrhotite 4 photos of Freibergite associated with Pyrrhotite on mindat.org. Palache, Charles, Harry Berman & Clifford Frondel (1944) The System of Mineralogy of James Dwight Dana and Edward Salisbury Dana Yale University 1837-1892, Volume I: Elements, Sulfides, Sulfosalts, Oxides. John Wiley and Sons, Inc., New York. 7th edition, revised and enlarged: 379. American Mineralogist (1975): 60: 489. Paar, W. H., Chen, T. T. & Günther, W. (1978): Extrem silberreicher Freibergit in Pb-Zn-Cu-Erzen des Bergbaues "Knappenstube", Hochtor, Salzburg. Carinthia II, 168./88., 35-42 (in German). Moëlo, Y., Makovicky, E., Mozgova, N.N., Jambor, J.L., Cook, N., Pring, A., Paar, W., Nickel, E.H., Graeser, S., Karup-Møller, S.; Balić-Žunić, T.; Mumme, W.G., Vurro, F., Topa, D., Bindi, L., Bente, K., Shimizu, M. (2008) Sulfosalt systematics: a review. Report of the sulfosalt sub-committee of the IMA Commission on Ore Mineralogy. European Journal of Mineralogy, 20, 7-46. Soechting, W. et al. (2008): Economic Geology 103, 865-869. Jovic, S.M., Guido, D.M., Schalamuk, I.B., Ríos, F.J., Tassinari, C.C.G., Recio. C. (2011): Pingüino In-bearing polymetallic vein deposit, Deseado Massif, Patagonia, Argentina: characteristics of mineralization and ore-forming fluids. Mineralium Deposita, 46, 257-271. ; FERNANDEZ, Raúl R. et al. Gold and silver deposits related to Jurassic Patagonian volcanism: review and perspectives for exploration. Rev. Asoc. Geol. Argent. [online]. 2008, vol.63, n.4, pp. 665-681.; PENALVA, G. A et al. Intrusive bodies associated with the polymetallic mineralization of the Cerro León deposit, area of Cerro Tranquilo anticline, Santa Cruz: Geophysical evidence. Rev. Asoc. Geol. Argent. [online]. 2008, vol.63, n.1, pp. 14-23. BHP Billiton; USGS Open-File Report 2009-1252 Sediment-hosted zinc-lead deposits of the world - Database and grade and tonnage models; Walters, S., & Bailey, A. (1998). Geology and mineralization of the Cannington Ag-Pb-Zn deposit; an example of Broken Hill-type mineralization in the eastern succession, Mount Isa Inlier, Australia. Economic Geology, 93(8), 1307-1329. Large, R. R., & McGoldrick, P. J. (1998). Lithogeochemical halos and geochemical vectors to stratiform sediment hosted Zn–Pb–Ag deposits, 1. Lady Loretta Deposit, Queensland. Journal of Geochemical Exploration, 63(1), 37-56. - Bojar, H.-P. (1999): 1189. Benleonardit, Diaphorit, Hessit, Gersdorffit, Greenockit, Magnetit, Meneghinit, Ullmannit, 2 unbekannte Cd-hältige Sulfide und ein nicht näher bestimmtes Ag-hältiges Pb-Sb-Sulfosalz vom Straßegg, Breitenau am Hochlantsch, Steiermark. Pp. 228-229 in Niedermayr, G. et al. (1999): Neue Mineralfunde aus Österreich XLVIII. Carinthia II, 189./109., 201-236. [MinRec 32:473]; Moricz, F., Walder, I. F., & Madai, F. (2009). Geochemical and mineralogical characterization of waste material from Itos Sn-Ag deposit, Bolivia. Proceeding of securing the future and 8th ICARD. Skellefteå, Sweden, 525-534. [MinRec 32:465]; Lindgren, W. and Creveling, J.G. (1928) The ores of Potosi, Bolivia. Economic Geology, 23, #3, 233-262. Georgiev, Georgi (2008) A genetic model of the Elatsite porphyry copper deposit, Bulgaria. GEOCHEMISTRY, MINERALOGY AND PETROLOGY • SOFIA 46, 143-160.; K. Bogdanov, A. Filipov, R. Kehayov (2005): Au-Ag-Te-Se minerals in the Elatsite porphyry-copper deposit, Bulgaria. Geochemistry, Mineralogy and Petrology, 43, 13-19.; Mladenova, V., Apostolova, R., & Ivanov, Z. (2017). Epithermal intermediate-sulfidation veins in the low-grade metamorphic rocks in the upper levels of the Elatsite porphyry copper deposit, Bulgaria. Review of the Bulgarian Geological Society, 78. Sabina, A.P. (1967) Rocks & minerals for the collector: Eastern Townships and Gaspé, Quebec and parts of New Brunswick. Geological Survey of Canada Paper 66-51, 125. Mark Mauthner (owns specimen); J. V. Gregory Lynch (1989) Large-scale hydrothermal zoning reflected in the tetrahedrite-freibergite solid solution, Keno Hill Ag-Pb-Zn district, Yukon Can Mineral 27:383-400; Oscar Jose Tessari (1979) Model Ages and Applied Whole Rock Geochemistry of Ag-Pb-Zn veins, Keno Hill - Galena Hill Mining Camp, Yukon Territory. MSc Thesis, University of British Columbia. Oscar Jose Tessari (1979) Model Ages and Applied Whole Rock Geochemistry of Ag-Pb-Zn veins, Keno Hill - Galena Hill Mining Camp, Yukon Territory. MSc Thesis, University of British Columbia. Traill, R. J., 1970, A Catalogue of Canadian Minerals; Boyle, R.W. (1965) Geology, geochemistry, and origin of the lead-zinc-silver deposits of the Keno Hill-Galena Hill area, Yukon Territory. Geological Survey of Canada, Bulletin 111, 310 p.
Darío Chinchilla, Lorena Ortega, Rubén Piña, Raúl Merinero, Daniel Moncada, Robert J. Bodnar, Cecilio Quesada, Antonio Valverde, Rosario Lunar (2016): The Patricia Zn–Pb–Ag epithermal ore deposit: An uncommon type of mineralization in northeastern Chile. Ore Geology Reviews 73, 104-126.; Chinchilla, D., Rodriguez Pinzón, A., Piña, R., Ortega, L., Lunar, R., Quesada, C., & Valverde, A. (2013, August). A mineralogical and fluid inclusion study of the Patricia Zn-Pb-Ag Deposit (Paguanta, NE Chile). In 12th SGA biennial meeting–Uppsala, Suecia. Feng Chengyou, Zhang Dequan, She Hongquan, Li Daxin, and Wu Jianshe (2005), In: Jingwen Mao and Bierlein, F.P., Eds. : Mineral Deposit Research: Meeting the Global Challenge. Proceedings of the Eighth Biennial SGA Meeting, Beijing, China, 18-21 August 2005, 607-610. Huiling Yao and Fengying Su (2003): Gold 24(1), 14-17.
ⓘ Fujiawu Cu-Mo deposit ? Xiao'ou Zhang, Cawood, P.A., Wilde, S.A., Ruqi Liu, Hailin Song, Wen Li, and Snee, L.W. (2003): Mineralium Deposita 38(2), 141-153.
ⓘ Sawaya'erdun Au-(Sb) deposit ? Chunji Xue, Rong Zeng, Shuwen Liu, Guoxiang Chi, Hairuo Qing, Yuchuan Chen, Jianmin Yang, and Denghong Wang (2006): Ore Geology Reviews (in press). Litochleb, J., Sejkora, J., Fišera, M.: Freibergit a jamesonit z historického ložiska stříbra Šebestěnice u Čáslavi (Česká republika). 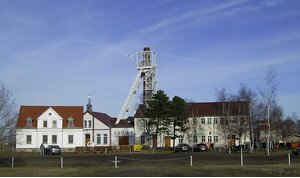 Bulletin mineralogicko-petrografického oddělení Národního muzea v Praze, 2008, vol. 16, 2, 193-196. Doležalová H., Losos Z. 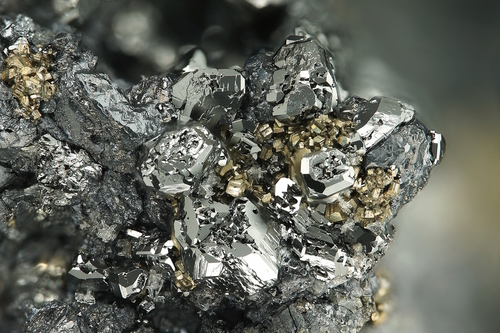 2006: Galena and Ag-minerals from Rožná uranium deposit. Mineralogia Polonica - Special Papers, vol. 28, 60-62 ; Kříbek, B., Žák, K., Dobeš, P., Leichmann, J., Pudilová, M., René, M., ... & Lehmann, B. (2009). The Rožná uranium deposit (Bohemian Massif, Czech Republic): shear zone-hosted, late Variscan and post-Variscan hydrothermal mineralization. Mineralium deposita, 44(1), 99-128. Kopperoinen, Timo & Tuokko, Ilkka 1988. The Ala-Luoma and Taivaljärvi Zn-Pb-Ag-Au deposits,eastern Finland. in. Archean Geology of the Fennoscandian shield. Proceedings of a Finnish-Soviet Symposium in Finland July 28- August 7, 1986. Geological Survey of Finland, Special Paper 4, 131-144.
ⓘ Vihanti deposit (Lampinsaari deposit; Isoaho deposit) ? Périchaud J.J. (1970) Les gisements métalliques du district à antimoine de Brioude-Massiac. PhD Thesis, Clermont-Ferrand. Frenzel, a. (1874): Mineralogisches Lexikon für das Königreich Sachsen, Leipzig. SKARPELIS, N. (2007): The Lavrion deposit (SE Attica, Greece): geology, mineralogy and minor elements chemistry. Neues Jahrbuch für Mineralogie Abhandlungen, 183, 227-249. ; P. Voudouris (2005) Gold and silver mineralogy of the Lavrion deposit, Attika, Greece. Mineral Deposit Research: Meeting the Global Challenge 2005, pp 1089-1092; Voudouris, P. (2005). Gold and silver mineralogy of the Lavrion deposit, Attika, Greece. In Mineral deposit research: meeting the global challenge (pp. 1089-1092). Springer Berlin Heidelberg. Hanke, H. (1998) Laurion - ein Rückblick auf die Funde der letzten drei Jahre. Mineralien-Welt, 9 (2), 37-45. Vodouris, P. C. (2011): Conditions of formation of the Mavrokoryfi high-sulfidation epithermal Cu–Ag–Au–Te mineralization (Petrota Graben, NE Greece). Mineralogy and Petrology 101, 97-113. G., Garuti, M., Scacchetti, F., Zaccarini (2006) Oro,freibergite, Argentite-acanthite, uraninite ed idroromarchite nel giacimento a solfuri di Corchia (Appennino Parmense) - Mineralparma, anno V, n 1, 7-18.
ⓘ La Cuccagna Mine ? ⓘ San Giovanneddu Mine (S'Ega Porceddu) ? ⓘ San Giovanni Mine ? ⓘ Rio dei Ronchi (Runggenbach; Telfer Weißen) ? MARIKO, T., KAWADA, M., MIURA, M., & ONO, S. (1996). Ore Formation Processes of The Mozumi Skarn-type Pb-Zn-Ag Deposit in the Kamioka Mine, Gifu Prefecture, Central Japan. Shigen-Chishitsu, 46(260), 337-354. Motomura (1978) Kouzan Chishitsu, 28, 43. Harada, K., Sakamoto, O., Nakao, K., & Nagashima, K. (1970). Bournonite from Daikoku, Chichibu Mine, Saitama, Japan. Mineralogical Journal, 6(3), 186-188. Bull. Minéral. , 1984, 107, pp. 285-305.; Alfonso, P., Torró, L., Mesa, C., Parcerisa, D., Mata-Perelló, J. M., González-Partida, E., ... & García-Valles, M. (2011). Mineralogical characterisation of the Tizapa ore deposit, Mexico. In 11th SGA Biennial Meeting—let's talk ore deposits (Vol. 2, pp. 781-783). Ediciones Universidad Católica del Norte Antofagasta, Chile. Kullerud, K., Kotková, J. & Škoda, R. (2016): Ag-Sb bearing minerals from the Kongsberg Silver Deposit, Buskerud, Norway. Norsk mineralsymposium 2016, 53-59. Cook, N. J., Halls, C., & Kaspersen, P. O. (1990). The geology of the Sulitjelma ore field, Northern Norway; some new interpretations. Economic Geology, 85(8), 1720-1737. Gołębiowska B., Pieczka A., Parafiniuk J. 2006: Cu(Ag)-Pb-Bi(Sb) sulphosalts from Rędziny (Western Sudetes, Poland). Mineralogia Polonica - Special Papers, vol. 28, 78-80; Gołębiowska, B., Pieczka, A. and Parafiniuk, J. (2012): Substitution of Bi for Sb and As in minerals of the tetrahedrite series from Rędziny, Lower Silesia, Southwestern Poland. Can. Mineral. 50, 267-279. A.M.R. Neiva, A. Moura & P.C.S. Carvalh (2015). Metallogenesis at the Terramonte Pb–Zn–Ag quartz vein, Portugal: Geological, mineralogical and geochemical evidences. Ore Geology Reviews, 71:14-28.; A.M.R. Neiva, A. Moura & P.C.S. Carvalh (2015). Metallogenesis at the Terramonte Pb–Zn–Ag quartz vein, Portugal: Geological, mineralogical and geochemical evidences. Ore Geology Reviews, 71:14-28. Relvas, J.M.R.S., Tassinari, C.C.G., Munhá, J., and Barriga, F.J.A.S. (2001): Mineralium Deposita 36, 416-427. D. Wimmers (1985) Silver Minerals of Panasqueira, Portugal: A New Occurrence of Te-Bearing Canfieldite. Mineralogical Magazine 49:745-748.; Bussink, R. W. (1984). Geochemistry of the Panasqueira tungsten-tin deposit, Portugal. Geologica Ultraiectina, 33, 1-170. Neiva, A. M. R. (1994): Gold-​quartz veins at Gralheira, northern Portugal: mineralogical and geochemical characteristics. Transactions of the Institution of Mining and Metallurgy, Section B: Applied Earth Science 103, B188-B196. Gregory Levitan (2008) Gold Deposits Of The CIS. Xlibris Corporation 352 p.; Sidorov, A. A., & Eremin, R. A. (1994). Metallogeny and gold lode deposits of northeastern Russia. ICAM-94 proceedings, 247-256. Goryachev, N. A. and M. L. Gelman (2001) Granitoids of the Okhotsk-Kolyma Divide and Related Ore Mineralization. pp5-28 in Khanchuk, A.I., Gonevchuk, G.A. & Seltmann, R. (Eds) Metallogeny of the Pacific Northwest (Russian Far East): Tectonics, Magmatism and Metallogeny of Active Continental Margins. IAGOD Guidebook series 11, Dalnauka Publishing House, Vladivostok 2004, 176 p; Sidorov, A. A., & Eremin, R. A. (1994). Metallogeny and gold lode deposits of northeastern Russia. ICAM-94 proceedings, 247-256. ROGULINA, L., MAKEEVA, T., PISKUNOV, Y. G., & SVESHNIKOVA, O. (2004). Первая находка платиноидов в рудах Майского золото-серебряного месторождения (Дальнегорск, Приморье). ; Shunso Ishihara, Valeri G. Gonevchuk, Galina A. Gonevchuk, Pavel G. Korostelev, Grigori R. Saydayn, Boris I. Semenjak And Vladimir V. Ratkin (1997) Mineralization Age of Granitoid-Related Ore Deposits in the Southern, Russian Far East. Resource Geology, 47(5), 255-261. Gvozdev, V.I. (2007): Geology of Ore Deposits 49(3), 215-226. Rogulina, L. I.; Sveshnikova, O. L.; Varlamov, D. A. (2012): Mineral composition and structure of ores of silver epithermal deposit Taezhnoe in Primorye. Razvedka i Okhrana Nedr 2012 (6), 32-39 (in Russian). ; Nokleberg, W.J., ed., (2010) Metallogenesis and tectonics of northeast Asia: U.S. Geological Survey Professional Paper 1765, 624 p.
Pavlova, G.G., and Borisenko, A.S. (2009): Ore Geology Reviews 35, 164-185.; Gamyanin, G. N., Anikina, E. Y., Bortnikov, N. S., Alpatov, V. V., Borisenko, A. S., & Nosik, L. P. (1998). The Prognoz silver-polymetallic deposit, Sakha: Mineralogy, geochemistry, and origin. GEOLOGY OF ORE DEPOSITS C/C OF GEOLOGIIA RUDNYKH MESTOROZHDENII, 40, 391-407.
ⓘ Čoka Marin deposit ? Onačila D., Rojkovičová Ľ., Žáková E., Repčok I., Eliáš K., Kalinaj M., 1993: Čiastková záverečná správa: Epitermálna žilná mineralizácia Hodrušského rudného poľa. Manuscript, ŠGÚDŠ-Geofond, Invent. No. : 78747 (in Slovak). Mikuš T., Chovan M., Pršek J. & Šlepecký T. (2003): Hydrothermal siderite -basemetal vein mineralizaton in the vicinity of Čavoj, Suchý Mts. Slovak Geological Magazine, 9, 4 207-216. Pesquera, A. and Velasco, F. (1989): The Arditurri Pb-Zn-F-Ba deposit (Cinco Villas Massif, Basque Pyrenees). A deformed and metamorphosed stratiform deposit. Mineralium Deposita, 24, 199-209. Fanlo, I., Subías, I., Mateo, E. (2010): Supergene enrichment of primary Cu–Ag assemblages in Ag at the Pardos deposit, Iberian Range, Spain. Can. Mineral., 48, 415-430. Martínez Abad, I., Cepedal Hernández, M. A., Arias Prieto, D. M., Martín Izard, A., & Fuertes Fuente, M. M. (2015). Geology and mineralogy of the Au-As (Ag-Pb-Zn-Cu-Sb) polymetallic deposit of Valiña-Azúmara (Lugo, NW Spain). Estudios Geológicos. Sagiroglu, A., & Sasmaz, A. (2004). Mineralogy and geochemistry of the argentiferous Pb–Zn and Cu veins of the Çolaklı́ area, Elazig, Eastern Turkey. Journal of Asian Earth Sciences, 23(1), 37-45. Pattrick, R.A.D. (1978) Microprobe Analyses of Cadmium-Rich Tetrahedrites from Tyndrum, Perthshire, Scotland. Mineralogical Magazine, vol.42, p. 286-288.; Livingstone, A. and Macpherson, H.G. (1983) Fifth supplementary list of British minerals (Scottish). Mineralogical Magazine, vol. 47, n° 342, p. 99-105.; Anthony, Bideaux, Bladh, Nichols (1990) Handbook of Mineralogy, Vol. 1. Dudar, T. V.; Shumlyanskii, V. A. (1999): Gold-bearing gersdorffite-freibergite mineral association at the low ore level in the Bobrikovo deposit. Dopovidi Natsional'noi Akademii Nauk Ukraini 1999 (3), 124-127. Anthony, J.W., et al (1995), Mineralogy of Arizona, 3rd.ed. : 226; Graeme, R. (1993), Bisbee revisited, Min.Rec. : 24: 421-436. Keith, Stanton B. (1974), AZ Bur. of Geol. & Min. Technology, Geol. Survey Br. Bull. 189, Index of Mining Properties in Pima County, AZ: 114 (Table 4); Arizona Bureau of Mines file data. Anthony, J.W., et al (1995), Mineralogy of Arizona, 3rd.ed. : 226. MRDS database Dep. ID file #10048349, MRDS ID #M899936. Keith, Stanton B. (1975), Arizona Bureau of Mines Bull. 191, Index of Mining Properties in Santa Cruz County Arizona: 59 (Table 4); Schrader (1915): 253-254; Arizona Bureau of Mines file data. Keith, Stanton B. (1975), Arizona Bureau of Mines Bull. 191, Index of Mining Properties in Santa Cruz County Arizona: 60 (Table 4); Schrader (1915): 248-251; Arizona Bureau of Mines file data. Anthony, J.W., et al (1995), Mineralogy of Arizona, 3rd.ed. : 226; Lindgren, W. (1926), USGS Bull. 782: 29, 129-130; Galbraith, F.W. (1947), Minerals of AZ, AZ Bur. of Mines Bull. 153: 15. Lindgren, W. (1926), USGS Bull. 782: 29, 118. Lindgren, W. (1926), USGS Bull. 782: 29, 162. Campbell, Ian & staff (1968), California Mining Review, 1967: California Division Mines & Geology Mineral Information Service: 21: 23; Pemberton, H. Earl (1983), Minerals of California; Van Nostrand Reinholt Press: 132; Mineralogical Record (1989): 20: 129-142. Hanks, Henry Garber (1886), Sixth report of the State Mineralogist: California Mining Bureau. Report 6 part 1, 145 pp. : 138; Murdoch, Joseph & Robert W. Webb (1966), Minerals of California, Centennial Volume (1866-1966): California Division Mines & Geology Bulletin 189: 363. Stetefeldt, C.A. (1874), Extract from a report on the Panamint mining district Engineering & Mining Journal: 18: 259; Crawford, James John (1894), Twelfth report of the State Mineralogist: California Mining Bureau. Report 12: 374; Murphy, Franklin Mac (1930), Geology of the Panamint silver district, California: Economic Geology: 25: 321; Hall, Wayne Everett & E.M. Mackevett (1958), Economic geology of the Darwin quadrangle, Inyo County, California: Calif Division of Mines Special Report 51, 77 pp. : 17; Hall, Wayne Everett & Edward M. Mackevett (1963), Geology and ore deposits of the Darwin quadrangle, Inyo County, California: USGS PP 368: 62; Pemberton, H. Earl (1983), Minerals of California; Van Nostrand Reinholt Press: 133-134. Hanks, Henry Garber (1884), Fourth report of the State Mineralogist: California Mining Bureau. Report 4, 410 pp. : 388; Murdoch, Joseph & Robert W. Webb (1966), Minerals of California, Centennial Volume (1866-1966): California Division Mines & Geology Bulletin 189: 363. USGS (2005), Mineral Resources Data System (MRDS): U.S. Geological Survey, Reston, Virginia, loc. file ID #10310707. Hulin, Carlton D. (1925), Geology and ore deposits of the Randsburg quadrangle, California: California Mining Bureau. Bulletin 95, 152 pp. : 97; Murdoch, Joseph & Robert W. Webb (1966), Minerals of California, Centennial Volume (1866-1966): California Division Mines & Geology Bulletin 189: 364; Pemberton, H. Earl (1983), Minerals of California; Van Nostrand Reinholt Press: 134. Laizure, Clyde McK (1921), Redding field division: California Mining Bureau. Report 17: 526; Murdoch, Joseph & Robert W. Webb (1966), Minerals of California, Centennial Volume (1866-1966): California Division Mines & Geology Bulletin 189: 85, 364; Albers, J.P. & C.H. Sandberg (1965), Economic geology of the French Gulch quadrangle: California Division Mines & Geology Special Report 85: 31-32; Lydon, Philip Andrew and O’Brien, J.C. (1974) Mines and mineral resources of Shasta County, California. California Division of Mines and Geology County Report 6, 154 pp. : 73-75, 135-136; Pemberton, H. Earl (1983), Minerals of California; Van Nostrand Reinholt Press: 134. Albers, J.P. & C.H. Sandberg (1965), Economic geology of the French Gulch quadrangle: California Division Mines & Geology Special Report 85: 31-32; Lydon, Philip Andrew and O’Brien, J.C. (1974) Mines and mineral resources of Shasta County, California. California Division of Mines and Geology County Report 6, 154 pp. ; Pemberton, H. Earl (1983), Minerals of California; Van Nostrand Reinholt Press: 134-135. Albers, J.P. & C.H. Sandberg (1965), Economic geology of the French Gulch quadrangle: California Division Mines & Geology Special Report 85: 31-32; Lydon, Philip Andrew and O’Brien, J.C. (1974) Mines and mineral resources of Shasta County, California. California Division of Mines and Geology County Report 6, 154 pp. : 73-75; Pemberton, H. Earl (1983), Minerals of California; Van Nostrand Reinholt Press: 134-135. Albers, J.P. & C.H. Sandberg (1965), Economic geology of the French Gulch quadrangle: California Division Mines & Geology Special Report 85: 31-32; Lydon, Philip Andrew and O’Brien, J.C. (1974) Mines and mineral resources of Shasta County, California. California Division of Mines and Geology County Report 6, 154 pp. : 73-75; Pemberton, H. Earl (1983), Minerals of California; Van Nostrand Reinholt Press: 134. Albers, J.P. & C.H. Sandberg (1965), Economic geology of the French Gulch quadrangle: California Division Mines & Geology Special Report 85: 31-32; Lydon, Philip Andrew and O’Brien, J.C. (1974) Mines and mineral resources of Shasta County, California. California Division of Mines and Geology County Report 6, 154 pp. : 135-136; Pemberton, H. Earl (1983), Minerals of California; Van Nostrand Reinholt Press: 135. Minerals of Colorado (1997) Eckel, E. B.; IRVING, J.D., AND BANCROFT, HOWLAND (1911), GEOLOGY AND ORE DEPOSITS NEAR LAKE CITY, COLORADO: USGS BULLETIN 478: 111-116.
ⓘ Pride of the West Mine ? ⓘ Galena Mine (Vulcan Mine) ? Ref: Montana Bureau of Mines and Gology Special Publication 75, 1977; U.S. Geological Survey, 2005, Mineral Resources Data System: U.S. Geological Survey, Reston, Virginia. Ranta, D. E. (1967). Supergene Enrichment at the Betty O'Neal Mine, Lander County, Nevada (Master dissertation, University of Nevada, Reno). North, Jerry (2010) Displays of Nature : History, Minerals & Crystals of Utah's Bingham Canyon Copper Mine.